Back in 1973, Texan B.W. Stevenson’s single “Shambala” was eclipsed by the Three Dog Night version of the song. Stevenson got together with that song’s writer, Daniel Moore, and they finished “My Maria,” a song with echoes of "Shambala." Stevenson’s version of “My Maria” became a Top 10 hit on the Billboard Hot 100. Twenty years later, producer Don Cook suggested that Brooks & Dunn record the tune. Kix Brooks was receptive, but Ronnie Dunn resisted because the pair hadn’t had any cover songs on their three previous Multi-Platinum™ albums. Some encouragement from the record label’s president helped settle the matter, and the two recorded the song. The single release was accompanied by a video directed by Michael Oblowitz. The video for "My Maria" was filmed in the Big Bend region of Texas. 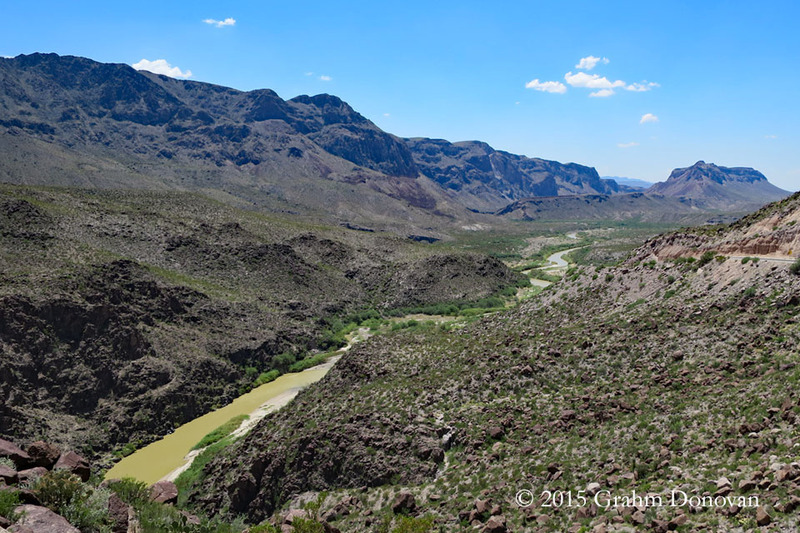 Exclusive: The shot actually is a view of the Rio Grande on the border between the U.S. and Mexico. 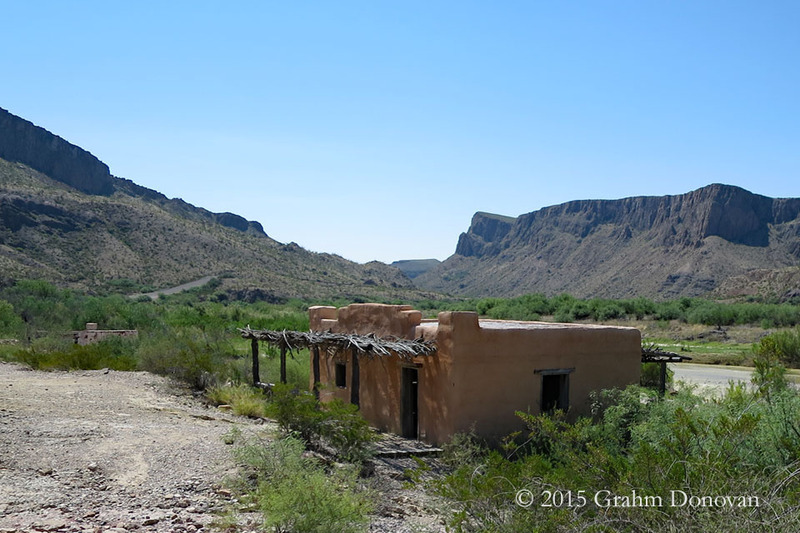 The view is from a scenic overlook on Farm to Market Road (FM) 170, near Redford, TX. A cowboy (Kix Brooks) searches for a beautiful woman along the border river and in a small village nearby. A singer (Ronnie Dunn) is later seen in front of an adobe church in the village. The village was a really a movie set called Contrabando, which was initially constructed for Uphill All the Way (1986). Since "My Maria" was filmed, Rio Grande flooding had damaged many of the structures, and most of the buildings have since been demolished. When Ronnie Dunn returned to the site in 2013, the church was collapsing. It was torn down by the time of my visit in July 2015, and other buildings were torn down by the end of 2015. The cowboy continues his quest at a dusty, desert town where he finds a hotel amongst the two-story buildings on the main street. The "town" with the Old West feel is known as the Boardwalk, and is actually part of the Lajitas Golf Resort, Lajitas, TX 79852. While Lajitas is a historic area, the Boardwalk was built after a businessman bought Lajitas in 1977 and began building the resort. Reference: I learned about the filming at this location from a post about a blogger's visit in 2008. As he closes in on the beautiful woman, the cowboy is seen on horseback as his horse rears up between two pillars. 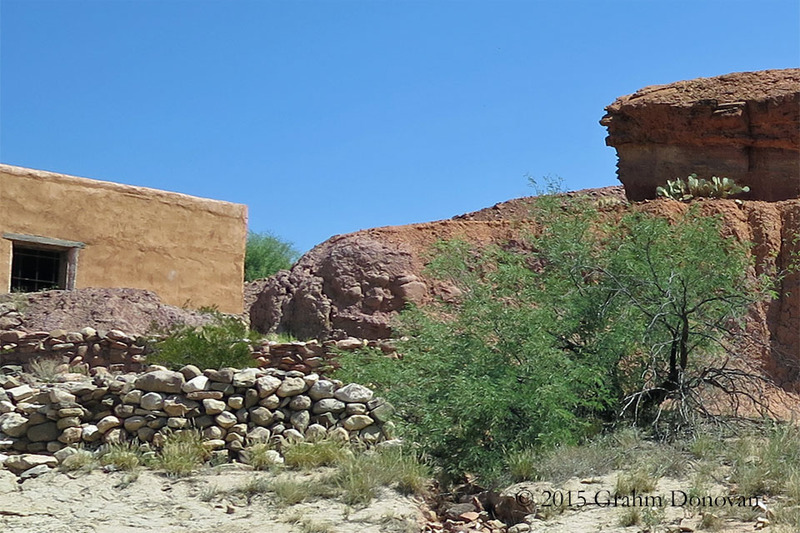 The pillars stand at the gateway to the Terlingua Cemetery, Terlingua, TX 79852. Reference: Since there are graves in the background of the scene, it was easy to guess that this shot had to be at the nearest large cemetery, in relation to the other locations. "My Maria" went on to become a big hit for Brooks & Dunn. The song spent 3 weeks at Number 1 on the Billboard Hot Country Chart, and earned the pair a GRAMMY Award for Best Country Vocal Performance By A Duo Or Group. In 2009, the pair announced the end of their successful 20-year partnership, and they each moved on to solo projects. Kix Brooks has even done some acting in several films. In 2014, Brooks & Dunn announced that they would be reuniting to perform shows with Reba McEntire. The three continue their residency, “Together in Vegas,” at The Colosseum at Caesars Palace.